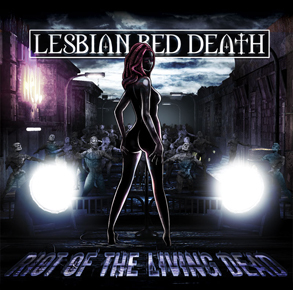 Lesbian Bed Death are a UK band who combine punk and hard rock influences that have been around since 2004. Since then they've been through various lineup changes. Their debut album (I use my powers for evil) was released in 2006. Their second album (Designed By The Devil, Powered By The Dead) was released on Halloween 2010, and after touring in support of that album, the band raised funds through Plesge music and used the money raised to record their latest album - Riot of the living dead. Opening with wailing electric guitars backed by some chunky riffs "Darkness falls" gets the album off to a very promising start. It's a good fast paced song with a nice guitar solo halfway through. The vocals are great too. Definitely a very good start to things. "Halloween" opens with a guitar riff that sounds very much like the one at the start of the Rainbow hit "Since you've been gone", just slightly more raw sounding. It's another good song, and the lyrics work well too - definitely one of my favourites on the album. There's a nice mix of rock and punk influences here which have combined to create a great sound - plenty of power, aggression and above all attitude, mixed with good hard rock guitar work and some great songs. Bands like Lesbian Bed Death, and Devilish Presley are showing that punk is far more versatile and impressive than many people give it credit for. Definitely an album thats well worth a listen.